Teeth are a wonderfully complex part of the human body. It is easy for most of us to overlook all of the ways that our teeth have an impact upon our daily lives from birth to old age - from affecting the overall look of our face and enjoying foods, to the important role they play in helping to prevent health problems in other parts of our body, including our heart. You may not realize it, but your baby is born with a complete set of teeth; small as they are, hidden in the deep recesses of the jawbone. From birth to about the age of 3, you will witness in your child the gradual eruption of 20 primary teeth, also called "baby teeth." Primary teeth are important because they are essential in the development and location of what they will eventually be replaced by: a full set of 32 permanent teeth (16 each on top and bottom) in the adolescent and young adult. Primary teeth maintain the spaces where permanent teeth will later erupt, and also help in speech development and aesthetics. Take good care of your child's primary teeth. Even though primary teeth last only a few years, decay, cavities and infection can take their toll, and may require expensive treatment. Your child will generally have all his or her primary teeth by the age of 3, and will keep all of them until age 5 or 6, when they begin to loosen and fall out. The first primary teeth to shed are typically the front teeth on the bottom. The process of shedding primary teeth usually lasts until the child is 12 or 13. It is common for your child to retain some primary teeth to the age of 12 or 13; this is usually the case with molars and canines. If your child loses a primary tooth too soon (either from injury or disease), the permanent tooth may not be ready to erupt. Consequently, surrounding teeth may "hog" the space left by the lost primary tooth, leading to problems later on when the permanent tooth begins to erupt. When primary teeth erupt out of their proper positions, this may lead to "malocclusion," which causes teeth to become misaligned, crowded, or crooked. 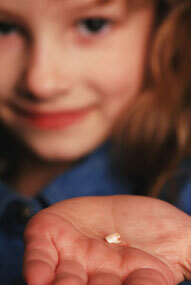 Consult our office if you think your child loses a primary tooth too soon. In many cases, future problems can be avoided by space maintainers, which are appliances that hold surrounding teeth at bay. Once the permanent tooth is ready to erupt, the appliance may be removed.